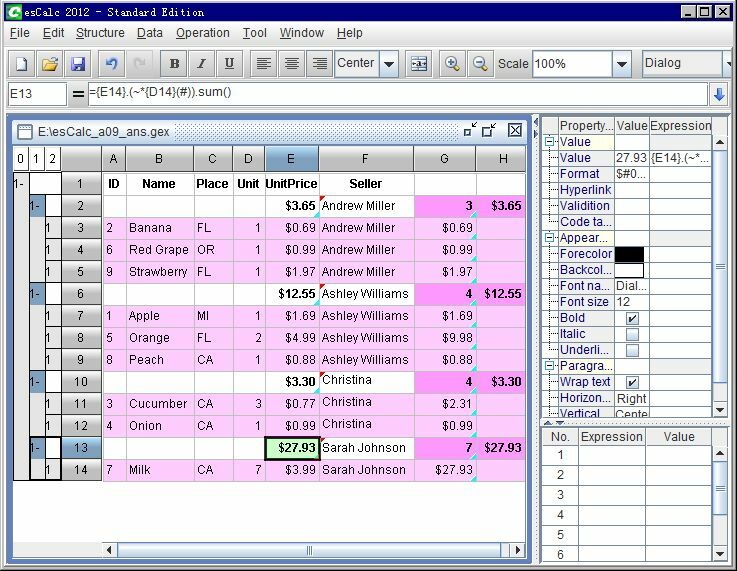 esCalc 2012 無料ダウンロード - Smarter spreadsheet for business data calculating beyond Excel. esCalc (http://www.raqsoft.com/product-escalc) is a powerful and smarter spreadsheet software for business data computing and analytics. As a desktop tool, esCalc is easy to install and user friendly, and not requires high technical background to handle various data from database, text, and Excel file. esCalc combines with Excel but is beyond Excel on complex tabular data calculation. esCalc adopts step by step computing to process the tabular data without pre-modeling. It directly presents the result of operation in each step, which are more visual, concrete, and easy-to-understand. esCalc boasts the powerful data analysis and computation functionalities, as well as the unique multi-level table structure to describe the real world business perfectly. The computations of the same type can be concluded reasonably with just a simple formula to accomplish the batch calculating. esCalc provides the network-style edit interface for convenient report design and supports for various statistics chart with enhanced report readability and pleasant appearance. The report can be prepared and printed directly or published to the various format such as TXT, XLS, or HTML. esCalc delivers numerous advantages: Smarter spreadsheet calculating, Friendly UI, Easy and flexible, Agile and Efficient, esCalc Leads to REAL OLAP, Powerful and creative, esProc enables self-service reports. Free version: esCalc 2012 free edition is available immediately and free for lifetime after installation. Trial version: Enter the registration code to run, and the code will expire and get updated at the end of each month. There is no function limitation. Standard version: To get esCalc 2012 standard edition, please go to our Buy Now page.